Philip Marron had a great win in the Meath novice cross country championships yesterday. The result was in doubt right to the end with Philip only getting the better of Niall Coryn (Dunboyne) in the sprint for the line. 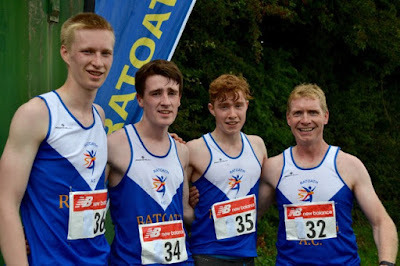 He was well supported by Ciaran Crowther (6th), Peter Kilgannon 12th and the youthful looking Hugh Kelly (31st) who took time out from his marathon training to help the lads win bronze team medals (the team was only allowed compete after producing ID proof that he is over 18). Adam Quinn, who is more of a track specialist, found the going tough in the u 16 boys but showed great determination as he battled all the way to the finishing line. Overall, our juvenile section had a wonderful day at the championships and a separate report will follow.